CK Euphoria Gold Men is an elegant male Eastern fern fragrance. CK Euphoria Gold Men 100ml. Eau De Toilette is an elegant male Eastern fern fragrance, which is a new edition of the popular perfume Euphoria Men by brand Calvin Klein. Composition intoxicating luxury and gold. Flanker 2014 inherited from his predecessors bottle, which is only slightly changed its color, finding noble shades of bronze. The composition opens with a mixture of original bitter citrus freshness of lemon and spicy ginger. In the heart prevails honey, flavored with warm cinnamon and spicy basil, and a deep, warm base flavor is slightly spicy notes of patchouli surrounded sweetish vanilla and amber. Chic flavor, deep and alluring in the world of luxury and wealth. This Limited Edition - Eastern fern fragrance for men. Go out in the luxury perfume duo, along with a female Eastern fruity aroma Calvin Klein Euphoria Gold Limited Edition, intoxicating composition inspired by the noble pure radiance of gold, and its sound is dedicated force majeure intoxicating desire and inexhaustible pleasure that one experiences when immersed in sensual and alluring world of wealth and luxury. 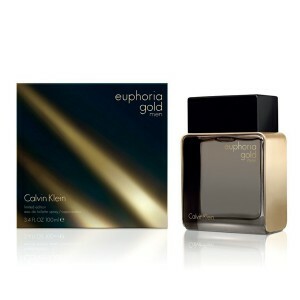 Perfume Calvin Klein Euphoria Men Gold begins with fresh sparkling combination of sweet ginger and refreshing Sicilian lemon, warmed by the gentle rays of the Italian sun and caressed by the mighty Mediterranean winds. At the heart of the perfume powerfully and uncompromisingly dominated by notes of honey, cinnamon and spicy fragrant basil exciting, come to the pyramid to agitate and excite, and its deep, warm and sensual trail built on shades of amber, patchouli and sweet bourbon vanilla. Sensual oriental flair masculinity and attractive force of gravity lies in the gold bottle design of its popular predecessor Euphoria Liquid Gold Men, made of translucent amber and black glass, the side surfaces are gracefully decorated with gold-plated metal. Buy perfume Calvin Klein Euphoria Gold Men Limited Edition can be in the amount of 100 ml Eau de Toilette concentration and forever surround yourself with seductive magic Men.